Nissan Sunny Pulsar GTI-R, LH rear handbrake cable, new genuine part. New LH rear handbrake cable, Sunny Pulsar GTI-R models, new genuine part. Sunny N14 Hatchback 1.4 (82bhp) RR LH. Sunny N14 Hatchback 1.4 MPi (87bhp) RR LH. Sunny N14 Hatchback 1.6 (94bhp) RR LH. Sunny N14 Hatchback 1.6 SPi (94bhp) RR LH. Sunny N14 Hatchback 1.6 MPi (100bhp) RR LH. Genuine drivers side rear brake hose for the Sunny Gti n14. Part number on packaging in picture. These retail for about £40 from Nissan so grab a bargain here. Front Handbrake Cable. Nissan Sunny (N14) 1991-1995. Sunny Van (Y10) 1992-1996. Changed your mind?. Hand Brake Cable - LH(N14) (JE07615) - QTY:1. Any claims after 24 hours will be dismissed for a claim. Your First Stop For All Car Parts! NISSAN S UNNY. You are obliged to take reasonable care of the item. The handbrake cables link the handbrake lever to the parking brakes to stop the car from rolling downhill. Browse our website to find handbrake cables for all handbrake systems. Handbrake Cable. Pulling on the handbrake causes the primary cable to draw up the yolk, causing tension in the secondary cable; this instigates the braking action. The handbrake cables link the handbrake lever to the parking brakes to stop the car from rolling downhill. Browse our website to find handbrake cables for all handbrake systems. Pulling on the handbrake causes the primary cable to draw up the yolk, causing tension in the secondary cable; this instigates the braking action. Any claims after 24 hours will be dismissed for a claim. Failure to do so will delay your order. NISSAN SUNNY Mk II (N13) 1.3 Saloon Petrol 07/1986 10/1991 FWD 8 60 44. NISSAN SUNNY Mk II (N13) 1.4 Saloon Petrol 10/1988 09/1990 FWD 16 82 60. NISSAN SUNNY Mk II (N13) 1.4 LX Saloon Petrol 10/1988 08/1991 FWD 16 75 55. Sunny N13 Coupe 1.6 ZX (122bhp) RR RH. Sunny N13 Estate 1.3 (60bhp) RR RH. Sunny N13 Hatchback 1.3 (60bhp) RR RH. Sunny N13 Hatchback 1.4 (82bhp) RR RH. Sunny N13 Hatchback 1.6 (84bhp) RR RH. Sunny N13 Hatchback 1.7 (55bhp) RR RH. NISSAN SUNNY Mk II Coupe (B12) 1.6 Coupe Petrol 06/1986 10/1988 FWD 8 84 62. NISSAN SUNNY Mk II (N13) 1.3 Saloon Petrol 07/1986 10/1991 FWD 8 60 44. NISSAN SUNNY Mk II (N13) 1.4 Saloon Petrol 10/1988 09/1990 FWD 16 82 60. Nissan Sunny 120Y 1.2 (B210) 1973-78. Nissan Cherry 140Y 1.4 (B210) 1973-78. SUCH AS COLOUR FADE OR SMALL SCRATCHES. 50 years of experience to help and guide you through your enquiry. With a great range of car care and accessories to see you through all seasons. NEW FRONT BRAKE CABLE BC2078. NISSAN SUNNY FWD (B11) not estate (82-86). QH BC 833 (VJB 078). Front Handbrake Cable. Nissan Sunny B210 Series 120Y, 140YA 1973-1978. Changed your mind?. FRONT HANDBRAKE CABLE. NISSAN SUNNY 1.6 1.6i 1.7D 1.8. SUCH AS COLOUR FADE OR SMALL SCRATCHES. 50 years of experience to help and guide you through your enquiry. With a great range of car care and accessories to see you through all seasons. We have a vast knowledge of car spares at Wilco Direct. Any claims after 24 hours will be dismissed for a claim. FKB1325 / BB12073B. NISSAN SUNNY 1.3 (82-92). NISSAN SUNNY 1.5 (82-86). NISSAN CHERRY 1.0, 1.2, 1.3, 1.5 (82-86). Nissan Sunny N13, LH rear handbrake cable, new genuine part. Brake drum models. 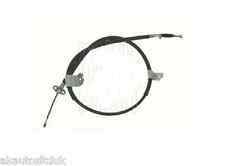 New LH handbrake cable, N13 Sunny models, years 86-91,rear drum models not ZX. Nissan Sunny N13, RH rear handbrake cable, new genuine part. Brake drum models. New RH handbrake cable, N13 Sunny models, years 86-91,rear drum models not ZX. NISSAN SUNNY 1200 B110 Series. HANDBRAKE CABLE - REAR. 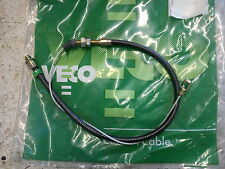 NEW LH REAR BRAKE CABLE - BC2378,FKB1725. NISSAN 100NX (91-95). NISSAN SUNNY N14 (90-95) not 2.0. NISSA - SUNNY Mk II Hatchback (N13) - 1.4 LX 01.89-08.91 -. NISSA - SUNNY Mk II Hatchback (N13) - 1.6 i 12V 06.86-10.90 01.89-. NISSA - SUNNY Mk II Hatchback (N13) - 1.7 D 06.86-01.91 -. NISSA - SUNNY Mk II (N13) - 1.3 07.86-10.91 -12.89. Moprod MBC1014, compares with BC834, replaces o.e. 36531-H50000. Nissan Sunny 140Y 1.4 B210 73 - 78. Nissan Sunny 120Y 1.2 B210 73 - 78. Hand brake cable - rear RH. 100NX B13 Coupe 1.6 SPi (89bhp) RR RH. 100NX B13 Coupe 1.6 MPi (101bhp) RR RH. Sunny N14 Hatchback 1.4 (82bhp) RR RH. Sunny N14 Hatchback 1.4 MPi (87bhp) RR RH. Sunny N14 Hatchback 1.6 (94bhp) RR RH. Sunny N14 Hatchback 1.6 SPi (94bhp) RR RH. Rear LH section of hand brake cable QH BC2073. Sunny 1.3 B11 5/82 - 86 ( not Estate models ). Sunny 1.5 B11 5/82 - 86 ( not Estate models ). Sunny 1.7 Diesel B11 5/82 - 86. Nissan Cherry 1.0 N12 9/82 - 86. NISSAN SUNNY Mk III (N14) 1.6 i 16V Saloon Petrol 10/1992 05/1995 FWD 16 102 75. NISSAN SUNNY Mk III Hatchback (N14) 1.6 i 16V Hatchback Petrol 10/1992 05/1995 FWD 16 102 75. NISSAN SUNNY Mk III Hatchback (N14) 2.0 GTI 16V Hatchback Petrol 10/1990 05/1995 FWD 16 143 105. FITS NISSAN SUNNY 120Y & 140Y. REAR HAND BRAKE CABLE. CABLE DE FREIN SKYLINE, LAUREL, VIOLET, CEDRIC & BRAKE CABLES . NEW IN ORIGINAL MOPROD or QH BAG. MANUFACTURED BY MOPROD or QUINTON HAZEL. NISSAN PART NO : 36531-H5000. Quinton Hazell BC833 BC834. Nissan Sunny 120Y 140Y B210 1973-78. NISSAN SUNNY (B11) 1.3 Saloon Petrol 03/1982 09/1987 FWD 8 60 44. NISSAN SUNNY (B11) 1.5 Saloon Petrol 03/1982 10/1986 FWD 8 75 55. NISSAN SUNNY Coupe (B11) 1.5 Coupe Petrol 03/1982 10/1986 FWD 8 75 55. Part No : ADN146168. NISSAN SUNNY N13 1986-91 1.8i Coupe,H/b - ZX FWD 5 MTM CA18DE N13 07/89>12/91. NISSAN SUNNY B11/2 1982-92 1.6i Coupe - ZX FWD 5 MTM CA16DE B12 01/87>12/89. NISSAN SUNNY B11/2 1982-92 1.8i Coupe - ZX FWD 5 MTM CA18DE B12 01/89>12/91. 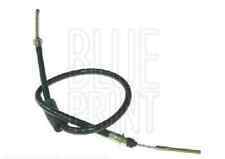 FORNT HAND BRAKE CABLE NISSAN BLUEBIRD AND SUNNY MK2 -91. FITS NISSAN SUNNY 120Y & 140Y. FRONT HAND BRAKE CABLE. CABLE DE FREIN SKYLINE, LAUREL, VIOLET, CEDRIC & BRAKE CABLES . NEW IN ORIGINAL QH BAG. B 210 SERIES. MANUFACTURED BY QUINTON HAZEL. 1 AVAILABLE.